Sammamish is a city in King County, Washington, United States. Start off your visit on the 13th (Tue): do a tasting at Chateau Ste. 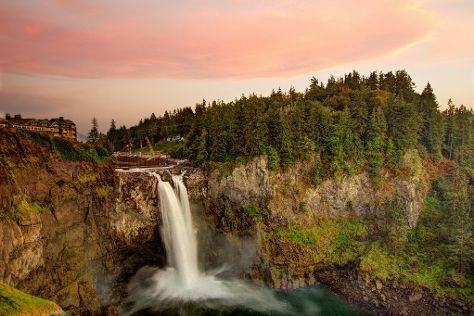 Michelle Vineyards, relax in the rural setting at Remlinger Farms, and then take in the dramatic scenery at Snoqualmie Falls. On the 14th (Wed), you'll have a packed day of sightseeing: take your sightseeing to a higher altitude at Mt Si and then try your luck at Snoqualmie Casino. For maps, other places to visit, traveler tips, and tourist information, go to the Sammamish trip itinerary maker tool . Seattle to Sammamish is an approximately 1-hour car ride. In November, daily temperatures in Sammamish can reach 52°F, while at night they dip to 41°F. Finish up your sightseeing early on the 14th (Wed) so you can travel to Palm Desert. Palm Desert is a city in Riverside County, California, United States, in the Coachella Valley, approximately 14 miles (23 km) east of Palm Springs and 122 miles (196 km) east of Los Angeles. Kick off your visit on the 15th (Thu): tour the pleasant surroundings at The Living Desert Zoo and Gardens, then admire the natural beauty at Sunnylands, and then shop like a local with El Paseo Shopping District. Make your Palm Desert itinerary with Inspirock to find out what to see and where to go. Use the Route module to find suitable travel options from Sammamish to Palm Desert. Traveling from Sammamish in November, expect nights in Palm Desert to be somewhat warmer, around 55°F, while days are much hotter, around 79°F. Finish up your sightseeing early on the 15th (Thu) so you can travel back home.